Welcome to Week 2 of Tone Up: Taming the Tone in Our Homes. We decided to keep a jar in our homes to fill with black or white beans to reflect how the current tone affected us and the members of our family. Essentially, the idea is to try to increase the positive (white beans) and decrease the negative (black beans). My kids and I brainstormed a Low Impact Bean Jar activity for those whose homes have pre-schoolers and toddlers. 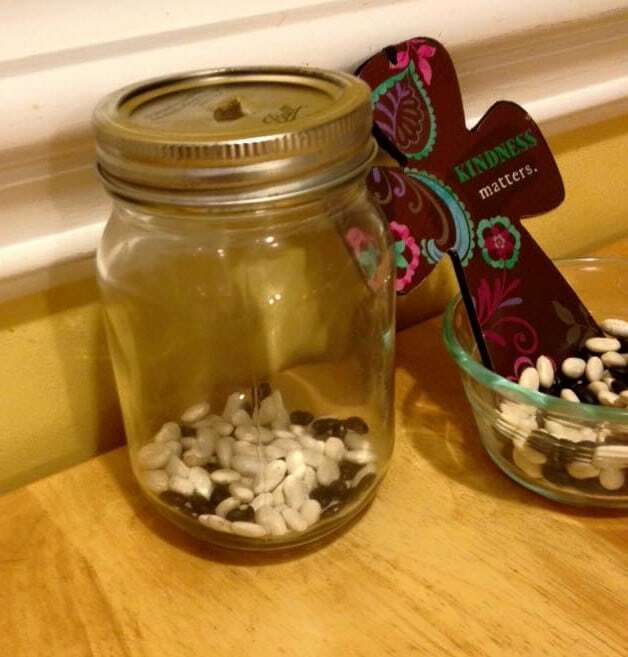 My kids suggested that the bean jar would be more effective if it held jelly beans for “Happy Hearts” that can be eaten at the end of the day or hour as needed. My oldest daughter thought black jelly beans would be a cruel punishment for “Grumpy Hearts” but it would probably work just as well to only reward “kind words” or “thankful hearts” or whatever verbage you use. We’ve also been working on memorizing two Scriptures. Proverbs 11:24-25 One person gives freely yet gains even more; another withholds unduly but comes to poverty. A generous person will prosper; whoever refreshes others will be refreshed. We are sending each other postcards during each week to remind one another of the Scriptures. If you want to join the online FB group and participate here, it’s not too late. Just make REQUEST TO JOIN and make sure that you select to receive notifications so you know what is going on. As for Week 2 . . . . Sigh. It’s not going that well for me zeroing in on a zen moment to write and meditate and pray and develop brilliant thoughts. In fact, my kids, and my new dog, and my now sick husband have made for a distinctly dissonant tone. That’s how it is a lot of the time, isn’t it? Even with my best intentions, with dozens of verses printed out on little index cards, and categorizing them into little groups like “Praise” “Thanks” and “For Kids,” the words are just blurring together in a way that reminds me more of my life NOW and not of the symphonic peaceful sounds I am dreaming this study will bring. The words are so black and white. Trust. Praise. Give Thanks. Teach. They seem to say One. Clear. Thing. But in practice, taming the tone is WAY hard. Cuz, maybe sometimes I don’t want to set my mind on things that are above. Maybe sometimes I don’t want to acknowledge him in all my ways. Maybe sometimes I just don’t want to put on kindness, humility, meekness and L-O-V-E. So, in spite of all the methods for organizing the class that I PLANNED to do, I have decided that this week we are going to talk about Taming the Tone in our very own, pretty little heads. What do I say to myself about my own words? How do I talk to myself? Is it true? Is it positive? Am I believing and listening to what God saying about me in His Word? Am I believing his promises and purposes for me and my roles as a friend, daughter, wife, sister, mother, grandmother, aunt, employee . . . ? Do I believe he has equipped me and designed me for those positions? We’ll discuss these questions and probably lots more at our meeting on Thursday, and I’ll sum up our discussion in another vlog post. Thank you for not judging the vlogs too harshly as I am no expert. Please take a minute to read over our Scriptures for Week 2, which all have a song to go with them. Click the link to the Seeds Family Worship site and select the song indicated. AND because I cannot resist this one and how it gives me heavenly hope . . . Thanks so much for joining me with this study. If nothing else, I hope it is keeping your mind tuned in (hardy har) to the tone of your home. It’s not so pretty when you first start a workout, but I’m hoping the more we practice and discipline ourselves, the better we’ll do. Also, for accountability purposes, the more you can participate in the Facebook group, the more of a community it will be for all of us! See you Thursday!